Abu Musab al-Zarqawi (Arabic: أبومصعب الزرقاوي, ’Abū Muṣ‘ab az-Zarqāwī) (October 20, 1966 – June 7, 2006) led Al-Qaeda in Iraq until his death in June 2006. Zarqawi took responsibility, on several audiotapes, for numerous acts of terrorism in Iraq and Jordan. These acts include suicide bombings, and the killing of soldiers, police officers, and civilians. As an Islamist identified with the Salafi movement, Zarqawi opposed the presence of United States and Western military forces in the Islamic world and opposed the West's support for and the existence of Israel. In September 2005, he reportedly declared "all-out war" on Shia Muslims in Iraq and is believed responsible for dispatching numerous Al-Qaeda suicide bombers throughout Iraq, especially to areas with large concentrations of Shia civilians. As the leader of Al-Qaeda in Iraq he was suspected of responsibility for thousands of deaths. Ahmad Fadeel al-Nazal al-Khalayleh (Arabic: أحمد فضيل النزال الخلايله, ’Aḥmad Faḍīl an-Nazāl al-Ḫalāyla), is believed to have been al-Zarqawi's real name. "Abu Musab" literally translates to "Musab's father," while the surname "al-Zarqawi" translates as "man from Zarqa." Zarqawi was a native of the Jordanian city of Zarqa, located approximately 21 kilometers (13 miles) northeast of the capital Amman. The son of a native Jordanian family (al-Khalayleh of the Beni Hassan tribe), Zarqawi grew up in the Jordanian city of Zarqa amidst poverty and squalor. He was allegedly a street thug and at the age of 17, he dropped out of school. According to vague Jordanian intelligence reports, Zarqawi was jailed briefly in the 1980s for drug possession and sexual assault. The son of a native Jordanian family (al-Khalayleh of the Beni Hassan tribe), Zarqawi grew up in the Jordanian city of Zarqa amidst poverty and squalor. He was allegedly a street thug and at the age of 17, he dropped out of school. According to vague Jordanian intelligence reports, Zarqawi was jailed briefly in the 1980s for drug possession and sexual assault. Subsequently, he was active as a militant in Afghanistan, Jordan, Iraq and elsewhere. In 1989, Zarqawi traveled to Afghanistan to join the insurgency against the Soviet invasion, but the Soviets were already leaving by the time he arrived. It is thought that he met and befriended Osama bin Laden while there. Instead of fighting, he became a reporter for an Islamist newsletter. There are reports that in the mid-1990s, Zarqawi traveled to Europe and started the al-Tawhid paramilitary organization, a group dedicated to installing an Islamic regime in Jordan. Zarqawi was arrested in Jordan in 1992, and spent five years in a Jordanian prison for conspiring to overthrow the monarchy to establish an Islamic caliphate. He was arrested for possessing explosives. While in prison, he attempted to draft his cell mates into joining him to overthrow the rulers of Jordan. "You were either with them or against them. There was no gray area," a former prison mate told Time magazine in 2004. According to some reports, Zarqawi became a feared leader among inmates there. In prison he met and befriended Jordanian journalist Fouad Hussein, who, in 2005, published a book in Arabic on Zarqawi and al-Qaeda's strategy. Upon his release from prison in 1999, Zarqawi was involved in an attempt to blow up the Radisson SAS Hotel in Amman, where many Israeli and American tourists lodged. He fled Jordan and traveled to Peshawar, Pakistan, near the Afghanistan border. In Afghanistan, Zarqawi established a militant training camp near Herat, near the Iranian border. The training camp specialized in poisons and explosives. According to Jordanian officials and court testimony by jailed followers of Zarqawi in Germany, Zarqawi met in Kandahar and Kabul with Osama bin Laden and other al-Qaeda leaders after travelling to Afghanistan. He asked them for assistance and money to set up his own training camp in Herat. With al-Qaeda's support, the camp opened and soon served as a magnet for Jordanian militants. Jordanian and European intelligence agencies claim that Zarqawi formed the group Jund al-Sham in 1999 with $200,000 of start up money from Osama bin Laden. The group originally consisted of 150 members. It was infiltrated by members of Jordanian intelligence, and scattered before Operation Enduring Freedom. However, in March 2005, a group of the same name claimed responsibility for a bombing in Doha, Qatar. Sometime in 2001, Zarqawi was arrested in Jordan but was soon released. He was later convicted in absentia and sentenced to death for plotting the attack on the Radisson SAS Hotel. After the September 11 attacks, Zarqawi again traveled to Afghanistan and joined Taliban and al-Qaeda fighters resisting the U.S.-led invasion. He was allegedly wounded in a U.S. bombardment. He moved to Iran to re-organize al-Tawhid, his former militant organization. Later, Zarqawi supposedly traveled to Iraq to have his wounded leg treated at a hospital run by Uday Hussein. In the summer of 2002, Zarqawi was reported to have settled in northern Iraq, where he joined the Islamist Ansar al-Islam group that fought against the Kurdish-nationalist forces in the region. He reportedly became a leader in the group, although his leadership role has not been established. According to Perspectives on World History and Current Events (PWHCE), a not-for-profit project based in Melbourne, Australia, "Zarqawi was well positioned to lead the Islamic wing of the insurgency when the March 2003 invasion took place. Whether he remained in Ansar al-Islam camps until April 2003 or laid the preparations for the war during extensive visits to Baghdad and the Sunni Triangle is uncertain, but clearly he emerged as an important figure in the insurgency soon after the Coalition invasion." Zarqawi is believed to have had two wives. His first wife, Oum Mohammed, was a Jordanian woman who was around 40 years-of-age when Zarqawi died in June 2006. She lived in Zarqa, Jordan along with their four children, including a 7-year-old son, Musab. She had advised Zarqawi to leave Iraq temporarily and give orders to his deputies from outside the country. "He gave me an angry look and said, 'Me, me? I can't betray my religion and get out of Iraq. In the name of God, I will not leave Iraq until victory or martyrdom'" she quoted al-Zarqawi as saying. Zarqawi's second wife, Isra, was 14-years-old when he married her. She was the daughter of Yassin Jarrad, a Palestinian Islamic militant, who is blamed for the killing in 2003 of Ayatollah Muhammad Baqr al-Hakim, the Iraqi Shia leader. She bore him a child when she was 15 and was killed along with Zarqawi and their child, Abdul Rahman. Also killed was a five-year-old unidentified girl. Zarqawi was the most wanted man in Jordan and Iraq, having participated in or masterminded a number of violent actions against Iraqi, Jordanian and United States targets. The U.S. government offered $25 million U.S. dollars reward for information leading to his capture, the same amount offered for the capture of bin Laden before March 2004. On October 15 2004, the U.S. State Department added Zarqawi and the Jama'at al-Tawhid wal-Jihad group to its "list of Foreign Terrorist Organizations" and ordered a freeze on any assets that the group might have in the United States. On February 24 2006, the U.S. Department of Justice's FBI also added al-Zarqawi to the "Seeking Information – War on Terrorism" list, the first time that he had ever been added to any of the FBI's three major "wanted" lists. On June 7, 2006, Zarqawi was killed 1.5 miles (2.41 km) north of Hibhib, near the city of Baquba, Iraq, by a United States air strike, along with as many as eight other people, including women and children. He died from internal bleeding at 7:04/05pm, 50-55 minutes after the air strike, of injuries sustained in the bomb blasts. FBI tests later confirmed Zarqawi's identity. On June 15, 2006, it was confirmed that Egyptian Islamic Jihad militant Abu Ayyub al-Masri would succeed Zarqawi as head of Al-Qaeda in Iraq and the Iraqi insurgency. On October 12, 2006, the FBI removed the deceased al-Zarqawi profile, several months after his confirmed death. Zarqawi's first major attempt at a terrorist attack occurred in 1999 after his release from prison. He was involved in an attempt to blow up the Radisson SAS Hotel in Amman in 1999 because it was frequented by many Israeli and American tourists. He failed in this attempt and fled to Afghanistan and then entered Iraq via Iran after the overthrow of the Taliban in late 2001. From Iraq he started his terrorist campaign by hiring men to kill Laurence Foley who was a senior U.S. diplomat working for the U.S. Agency for International Development in Jordan. On October 28, 2002, Foley was assassinated outside his home in Amman. Under interrogation by Jordanian authorities, three suspects confessed that they had been armed and paid by Zarqawi to perform the assassination. United States officials believe that the planning and execution of the Foley assassination was led by members of Afghan Jihad, the International Mujaheddin Movement, and al-Qaeda. One of the leaders, Salim Sa'd Salim Bin-Suwayd, was paid over $27,858 U.S. dollars for his work in planning assassinations in Jordan against United States, Israeli, and Jordanian government officials. Suwayd was arrested in Jordan for the murder of Foley. Zarqawi was again sentenced in absentia in Jordan; this time, as before, his sentence was death. Zarqawi was also blamed for a series of deadly bomb attacks in Casablanca, Morocco in 2003. United States officials believe that Zarqawi trained others in the use of poison (ricin) for possible attacks in Europe. Zarqawi was also accused of planning to attack a NATO summit in June of 2004. According to suspects arrested in Turkey, Zarqawi sent them to Istanbul to organize an attack on a NATO summit there on June 28 or June 29 of 2004. On April 26 2004, Jordanian authorities announced they had broken up an alleged al-Qaeda plot to use chemicals weapons in Amman. Among the alleged targets were the U.S. Embassy, the Jordanian prime minister's office and the headquarters of Jordanian intelligence. 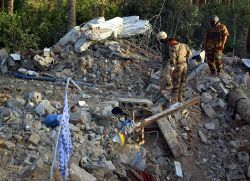 In a series of raids, the Jordanians said, they seized 20 tons of chemicals, including blistering agents and nerve gas, and numerous explosives. Also seized were three trucks equipped with specially modified plows, apparently designed to crash through security barricades. Jordanian state television aired a videotape of four men admitting they were part of the plot. One of the alleged conspirators, Azmi Al-Jayousi, said that he was acting on the orders of Abu-Musab al-Zarqawi. On February 15, 2006, Jordan's High Court of Security sentenced nine men, including al-Zarqawi, to death for their involvement in the plot. Zarqawi was convicted of planning the entire attack from his post in Iraq, funding the operation with nearly $120,000 U.S. dollars, and sending a group of Jordanians into Jordan to execute the plan. Eight of the defendants were accused of belonging to a previously unknown group, "Kata'eb al-Tawhid" or Battalions of Monotheism, which security officials say was headed by al-Zarqawi and linked to al Qaeda. Zarqawi was believed to have masterminded the 2005 Amman bombings that killed about 70 people in three hotels, including several officials of the Palestinian Authority and members of a Chinese defense delegation. Before the invasion of Iraq, Zarqawi ran a "terrorist haven" in Kurdish northern Iraq, and organized the bombing of a Baghdad hotel. According to a March 2003 British intelligence report, Zarqawi had set up "sleeper cells" in Baghdad before the Iraq war. The report stated "Reporting since (February) suggests that senior al Qaeda associate Abu Musab al-Zarqawi has established sleeper cells in Baghdad, to be activated during a U.S. occupation of the city...These cells apparently intend to attack U.S. targets using car bombs and other weapons. (It is also possible that they have received [chemical and biological] materials from terrorists in the [Kurdish Autonomous Zone]), …al Qaeda-associated terrorists continued to arrive in Baghdad in early March." In May 2004, a videotape was released showing a group of five men beheading American civilian Nicholas Berg, who had been abducted and taken hostage in Iraq weeks earlier. The CIA claimed that the speaker on the tape wielding the knife that killed Berg was al-Zarqawi. The speaker states that the murder was in retaliation for United States abuse at the Abu Ghraib prison (see Abu Ghraib prison abuse scandal). However, the CIA analysis failed to quell doubts about the validity of the claim because the man wears a mask in the video and did not resemble Zarqawi in other ways. Various Middle East correspondents and experts, including CNN's Octavia Nasr, have stated that the person talking on the Berg tape was not al-Zarqawi because he did not speak with a Jordanian accent. Following the death of al-Zarqawi, CNN spoke with Nicholas' father and long-time anti-war activist Michael Berg, who stated that al-Zarqawi's killing would lead to further vengeance and was not a cause for rejoicing. Zarqawi continued his campaign to behead hostages such as when he personally beheaded the British hostage Ken Bigley. United States officials also implicated Zarqawi for over 700 killings in Iraq during the invasion, mostly from bombings. According to the United States State Department, Zarqawi was responsible for the Canal Hotel bombing of the United Nations Headquarters in Iraq on August 19, 2003. This attack killed 22 people, including the United Nations secretary general's special Iraqi envoy Sergio Vieira de Mello. Zarqawi's biggest atrocities in Iraq included the attacks on the Shia shrines in Karbala and Baghdad in March 2004, which killed over 180 people, and the car bomb attacks in Najaf and Karbala in December 2004, which claimed over 60 lives. Zarqawi is believed by the former Coalition Provisional Authority in Iraq to have written an intercepted letter to the al-Qaeda leadership in February 2004 on the progress of the "Iraqi jihad." However, al-Qaeda denied they had written the letter. The U.S. military believes Zarqawi organized the February 2006 attack on the Al Askari Mosque in Samarra, in an attempt to trigger sectarian violence between Sunnis and Shi'ites in Iraq. In a January 2005 internet recording, Zarqawi condemned democracy as "the big American lie" and said participants in Iraq's January 30 election were enemies of Islam. Zarqawi stated "We have declared a bitter war against democracy and all those who seek to enact it… Democracy is also based on the right to choose your religion [and that is] against the rule of God." On April 25, 2006 a video appearing to show Zarqawi surfaced. In the tape, the man says holy warriors are fighting on despite a three-year "crusade." United State experts told the BBC they believed the recording was genuine. One part of the recording shows a man—who bears a strong resemblance to previous pictures of Zarqawi—sitting on the floor and addressing a group of masked men with an automatic rifle at his side. "Your mujahideen sons were able to confront the most ferocious of crusader campaigns on a Muslim state," the man says. Addressing United States President George W. Bush, he says: "Why don't you tell people that your soldiers are committing suicide, taking drugs and hallucination pills to help them sleep?" "By God," he says, "your dreams will be defeated by our blood and by our bodies. What is coming is even worse." The speaker in the video also reproaches the U.S. for its "arrogance and insolence" in rejecting a truce offered by "our prince and leader," Osama Bin Laden. The United States Army aired an unedited tape of Zarqawi in May 2006 highlighting the fact that he did not know how to fix a jam on his M249 Squad Automatic Weapon. Zarqawi was also shown to be wearing New Balance tennis shoes in the video, which contradicts his anti-American beliefs in addition to a lack of more rugged, durable boot. The aim of the video was to remove the myth surrounding Zarqawi and to question his prowess as a military leader. A document found in Zarqawi's safe house indicates that the group was trying to provoke the United States to attack Iran in order to reinvigorate the insurgency in Iraq and to weaken American forces in Iraq. "The question remains, how to draw the Americans into fighting a war against Iran? It is not known whether American is serious in its animosity towards Iraq, because of the big support Iran is offering to America in its war in Afghanistan and in Iraq. Hence, it is necessary first to exaggerate the Iranian danger and to convince America and the West in general, of the real danger coming from Iran ...." The document then outlines six ways to incite war between the two nations. After the 2001 war in Afghanistan, Zarqawi appeared on a U.S. list of most-wanted al-Qaeda terrorists still at large in early 2002. Since that time, Zarqawi's ties to al-Qaeda have been questioned, with some arguing he was more a rival to Osama bin Laden and acted independently of him. Before the invasion of Afghanistan, Zarqawi was the leader of an Islamic militant group loosely affiliated with al-Qaeda. When Zarqawi first met bin Laden it was loathing at the first sight as bin Laden distrusted and disliked Zarqawi immediately. In an interview on Al-Majd TV, former al-Qaeda member Walid Khan, who was in Afghanistan fighting alongside Zarqawi's group explained that from the day al-Zarqawi's group arrived, there were disagreements, differences of opinion with bin Laden on a number of issues and positions. Bin Laden also suspected that many of Zarqawi's group members were Jordanian intelligence, disliked Zarqawi's swagger and the green tattoos on his left hand, which he reportedly considered un-Islamic and found Zarqawi hatred of Shiites divisive (bin Laden's mother is a Shiite). Saif al-Adel, now bin Laden's military chief, was an Egyptian who attempted to overthrow the Egyptian government saw merit in Zarqawi's overall objective of overthrowing the Jordanian monarchy. He intervened and smoothed the relations between Zarqawi and Al Qaeda leadership. It was agreed that Zarqawi will be given $5,000 U.S. dollars to start up his training camp outside the Afghan city of Herat, near the Iranian border. Zarqawi's camp would be as far away as he could be from bin Laden as Saif al-Adel was appointed as the middle man. Zarqawi's group continued to received funding from Osama bin Laden but pursued "a largely distinct, if occasionally overlapping agenda," according to The Washington Post. Counterterrorism experts told the Washington Post that while Zarqawi accepted al-Qaeda's financial help to set up a training camp in Afghanistan he ran it independently and while bin Laden was planning September 11, Zarqawi was busy developing a plot to topple the Jordanian monarchy and attack Israel. Nixon Center terrorism experts Robert S. Leiken and Stephen Brooke explained that Zarqawi never meant to join al Qaeda. Militants have explained that Tawhid was especially for Jordanians who did not want to join al Qaeda. Even a confessed Tawhid member even told his interrogators that Zarqawi was against al Qaeda. Zarqawi's men "refused to march under the banner of another individual or group" recalls Nu'man bin-Uthman, a Libyan Islamist leader now living in London who was in contact with Zarqawi at the time. Shortly after 9/11, a fleeing Ramzi bin al-Shibh, one of the main plotters of the attacks, appealed to Tawhid operatives for a forged visa. He could not come up with ready cash. Told that he did not belong to Tawhid, he was sent packing and eventually into the arms of the Americans. The Washington Post also reported that German Intelligence wiretaps found that in the fall of 2001 that Zarqawi grew angry when his members were raising money in Germany for al-Qaeda's local leadership. "If something should come from their side, simply do not accept it," Zarqawi told one of his followers, according to a recorded conversation that was played at a trial of four alleged Zarqawi operatives in Duesseldorf. At least five times, in 2000 and 2001, bin Laden called al-Zarqawi to come to Kandahar and pay bayat—take an oath of allegiance to him. Each time, al-Zarqawi refused. Under no circumstances did he want to become involved in the battle between the Northern Alliance and the Taliban. He also did not believe that either bin Laden or the Taliban was serious enough about jihad. When the United States launched its air war inside Afghanistan, on October 7, 2001, al-Zarqawi joined forces with al-Qaeda and the Taliban for the first time. He and his Jund al-Sham fought in and around Herat and Kandahar. When Zarqawi finally did take the oath in October 2004, it was only after eight months of often stormy negotiations. Shortly after the invasion of Iraq in March 2003, Zarqawi returned to Iran, where he met with bin Laden's military chief, Saif al-Adel (Muhammad Ibrahim Makawi), who asked him to coordinate the entry of al-Qaeda operatives into Iraq through Syria. Zarqawi readily agreed and by the fall of 2003 a steady flow of Arab Islamists were infiltrating Iraq via Syria. Although many of these foreign fighters were not members of Tawhid, they became more or less dependent on Zarqawi's local contacts once they entered the unfamiliar country. Moreover, given Tawhid's superior intelligence gathering capability, it made little sense for non-Tawhid operatives to plan and carry out attacks without coordinating with Zarqawi's lieutenants. Consequentially, Zarqawi came to be recognized as the regional "emir" of Islamist terrorists in Iraq without having sworn fealty to bin Laden. On December 27 2004, Al Jazeera broadcast an audiotape of bin Laden calling Zarqawi "the prince of al Qaeda in Iraq" and asked "all our organization brethren to listen to him and obey him in his good deeds." Since that time, Zarqawi had referred to his own organization as Jama'at al-Tawhid wal-Jihad. According to experts, Zarqawi gave al-Qaeda a highly visible presence in Iraq at a time when its original leaders went into hiding or were killed after the Sept. 11, 2001, attacks in the United States. He established al-Qaeda's first military beachhead and training camps outside Afghanistan and by using the al-Qaeda name, Zarqawi bolstered his legitimacy and attracted media attention, as well as money and recruits. In turn, al-Qaeda leaders were able to brand a new franchise in Iraq and claim they were at the forefront of the fight to expel U.S. forces. But this relationship was proven to be fragile as Zarqawi angered al-Qaeda leaders by focusing attackings on Iraqi Shia's more often than United States military. In September 2005, U.S. intelligence officials said they had confiscated a long letter that al-Qaeda's deputy leader, Ayman al-Zawahiri, had written to Zarqawi, bluntly warning that Muslim public opinion was turning against him. According to Paul Wilkinson, chairman of the Center for the Study of Terrorism and Political Violence at the University of St. Andrews in Scotland, "A number of al-Qaeda figures were uncomfortable with the tactics he was using in Iraq...It was quite clear with Zarqawi that as far as the al-Qaeda core leadership goes, they couldn't control the way in which their network affiliates operated." In June 2004, Secretary of Defense Donald Rumsfeld conceded that Zarqawi’s ties to Al Qaeda may have been much more ambiguous, and that he may have been more a rival than a lieutenant to bin Laden. Zarqawi "may very well not have sworn allegiance to [bin Laden]," Rumsfeld said at a Pentagon briefing. "Maybe he disagrees with him on something, maybe because he wants to be ‘The Man’ himself and maybe for a reason that’s not known to me." Rumsfeld added that, "someone could legitimately say he’s not Al Qaeda." According to the Senate Report on Prewar Intelligence released in September 2006, "in April 2003 the CIA learned from a senior al-Qa'ida detainee that al-Zarqawi had rebuffed several efforts by bin Ladin to recruit him. The detainee claimed that al-Zarqawi had religious differences with bin Ladin and disagreed with bin Ladin's singular focus against the United States. The CIA assessed in April 2003 that al-Zarqawi planned and directed independent terrorist operations without al Qaeda direction, but assessed that he 'most likely contracts out his network's services to al Qaeda in return for material and financial assistance from key al Qaeda facilitators.'" In the April 2006 National Intelligence Estimate, declassified in September 2006, it asserts that "Al-Qa’ida, now merged with Abu Mus’ab al-Zarqawi’s network, is exploiting the situation in Iraq to attract new recruits and donors and to maintain its leadership role." Remains of Zarqawi's safe house, June 8, 2006. Zarqawi was killed on June 7, 2006 while attending a meeting in an isolated safehouse approximately 8 km (5 mi) north of Baqubah. At 14:15 GMT two United States Air Force F-16C jets identified the house and the lead jet dropped two 500-pound (230kg) guided bombs, a laser-guided GBU-12 and GPS-guided GBU-38 on the building. Six others—three male and three female individuals—were also reported killed (see below). Amongst those killed were his teenage wife and child. The joint task force had been tracking him for some time, and although there were some close calls, he had eluded them on many occasions. United States intelligence officials then received tips from Iraqi senior leaders from Zarqawi's network that he and some of his associates were in the Baqubah area. The safehouse itself was watched for over six weeks before Zarqawi was observed entering the building. Jordanian intelligence reportedly helped to identify his location. The area was subsequently secured by Iraqi security forces, who were the first ground forces to arrive. Initially, the United States military reported that Zarqawi was killed directly in the attack. However, according to a statement made the following day by Major General William Caldwell of the U.S. Army, Zarqawi survived for a short time after the bombing, and after being placed on a stretcher, attempted to move and was restrained, after which he died from his injuries. An Iraqi man, who claims to have arrived on the scene a few moments after the attack, said he saw U.S. troops beating up the badly-wounded but still alive Zarqawi. In contradiction, Caldwell asserted that when U.S. troops found Zarqawi barely alive they tried to provide him with medical help, rejecting the allegations that he was beaten based on an autopsy performed. The account of the Iraqi witness has not been verified. All others in the house died immediately in the blasts. On June 12, 2006 It was reported that an autopsy performed by the U.S. military revealed that the cause of death to Zarqawi was a blast injury to the lungs, but he took nearly an hour to die. The United States government distributed an image of Zarqawi's corpse as part of the press pack associated with the press conference. The release of the image has been criticized for being in questionable taste, and for inadvertently creating an iconic image of Zarqawi that would be used to rally his supporters. Prime Minister of Iraq Nuri al-Maliki commented on the death of Zarqawi by saying: "Today, Zarqawi has been terminated. Every time a Zarqawi appears we will kill him. We will continue confronting whoever follows his path. It is an open war between us." United States President George W. Bush stated that through his every action al-Zarqawi sought to defeat America and its coalition partners by turning Iraq into a safe haven for al-Qaeda. Bush also stated, "Now Zarqawi has met his end and this violent man will never murder again." Zarqawi's brother-in-law has since claimed that he was a martyr even though the family renounced Zarqawi and his actions in the aftermath of the Amman triple suicide bombing that killed at least 60 people. The opinion of Iraqis on his death is mixed; some believe that it will promote peace between the warring factions, while others are convinced that his death will provoke his followers to a massive retaliation and cause more bombings and deaths in Iraq. Abu Abdulrahman al-Iraqi, the deputy of al-Zarqawi (which may be the individual called "Sheik Abd-Al-Rahman" mentioned above, meaning he was not present as the bombing happened), released a statement to Islamist websites indicating that al-Qaeda in Iraq also confirmed Zarqawi's death: "We herald the martyrdom of our mujahed Sheikh Abu Musab al-Zarqawi in Iraq … and we stress that this is an honor to our nation." In the statement, al-Iraqi vowed to continue the jihad in Iraq. On June 16, 2006, Abu Abdullah Rashid al-Baghdadi, the head of the Mujahideen Shura Council, which groups five Iraqi insurgent organizations including al-Qaida in Iraq, released an audio tape statement in which he described the death of al-Zarqawi as a "great loss." He continued by stating that al-Zarqawi "will remain a symbol for all the mujahideen, who will take strength from his steadfastness." Al-Baghdadi is believed to be a former officer in Saddam's army, or its elite Republican Guard, who has worked closely with al-Zarqawi since the overthrow of Saddam's regime in April 2003. Counterterrorism officials have said that al-Zarqawi had become a key part of al-Qaeda's marketing campaign and that al-Zarqawi served as a "worldwide jihadist rallying point and a fundraising icon." Rep. Mike Rogers, R-Mich., who serves on the House Intelligence Committee, called al-Zarqawi "The terrorist celeb, if you will, ... It is like selling for any organization. They are selling the success of Zarqawi in eluding capture in Iraq." On June 23, 2006, Al-Jazeera aired a video in which Ayman al-Zawahiri, considered al-Qaeda's No. 2 leader, states that Zarqawi was "a soldier, a hero, an imam and the prince of martyrs, [and his death] has defined the struggle between the crusaders and Islam in Iraq." On June 30, 2006, Osama bin Laden released an audio recording in which he stated, "Our Islamic nation was surprised to find its knight, the lion of jihad, the man of determination and will, Abu Musab al-Zarqawi, killed in a shameful American raid. We pray to God to bless him and accept him among the martyrs as he had hoped for." Bin Laden also defended al-Zarqawi, saying he had "clear instructions" to focus on U.S.-led forces in Iraq but also "for those who ... stood to fight on the side of the crusaders against the Muslims, then he should kill them whoever they are, regardless of their sect or tribe." Shortly after, he released another audio tape in which he stated, "Our brothers, the mujahedeen in the al Qaeda organization, have chosen the dear brother Abu Hamza al-Muhajer as their leader to succeed the Amir Abu Musab al-Zarqawi. I advise him to focus his fighting on the Americans and everyone who supports them and allies himself with them in their war on the people of Islam and Iraq." A day before Zarqawi was killed, a U.S. strategic analysis site suggested that Zarqawi could have lost the trust of al-Qaeda due to his emphatic anti-Shia stance and the massacres of civilians allegedly committed in his name. Reports in The New York Times on June 9 treated the betrayal by at least one fellow al-Qaeda member as fact, stating that an individual close to Zarqawi disclosed the identity and location of Sheik Abd al-Rahman to Jordanian and American intelligence. Non-stop surveillance of al-Rahman quickly led to Zarqawi. ↑ Al Jazeera "Al-Zarqawi declares war on Iraqi Shia." September 14, 2005 Retrieved February 4, 2009. ↑ "Zarqawi and the 'al-Qaeda link'" BBC February 5, 2003. Retrieved February 4, 2009. ↑ "Profile: Abu Musab al-Zarqawi", BBC. November 10, 2005. Retrieved February 4, 2009. ↑ Lee Hudson Teslik, "Profile: Abu Musab al-Zarqawi", Council on Foreign Relations, June 8, 2006. Retrieved February 4, 2009. ↑ Weaver, Mary Anne, "The Short, Violent Life of Abu Musab al-Zarqawi", The Atlantic, June 8 2006. ↑ 8.0 8.1 "Timeline: Abu Musab al-Zarqawi", Guardian, June 8, 2006. ↑ "Death of Zarqawi: George gets his dragon", Asia Times, June 9, 2006. ↑ 10.0 10.1 10.2 10.3 "Zarqawi building his own terror network", Washington Post, October 3, 2004. ↑ "U.S. military: Al-Zarqawi was alive after bombing", CNN, June 9, 2006. ↑ "Profile of Abu Musab al-Zarqawi", GlobalSecurity, June 8, 2006. ↑ "Al-Zarqawi's Biography", Washington Post, June 8, 2006. ↑ 14.0 14.1 14.2 Napoleoni, Loretta, "The Myth of Zarqawi", Time.com, November 11, 2005. Retrieved February 4, 2009. ↑ Debat, Alexis, "The New Head of Jihad Inc.? ", ABC News, March 28, 2005. ↑ O'Reilly, Bill, "The Terrible Truth About Terror", Bill O'Reilly.com, September 16, 2004. ↑ "Abu Musab al-Zarqawi: The Usama bin Laden of Iraq", Perspectives on World History and Current Events (PWHCE). ↑ "Zarqawi's wife says she urged him to leave Iraq", USA Today, June 7, 2006. ↑ MacLeod, Scott; Bill Powell, "How They Killed Him", Time.com, June 11, 2006. Retrieved 2006-06-20. ↑ Parker, Ned, "Al-Zarqawi spoke, then died as US medics tried to save him", Times Online, June 10, 2006. Retrieved February 4, 2009. ↑ "Iraq backs Zarqawi wounded claim", BBC, May 26, 2005. ↑ FBI (February 24, 2006). FBI Updates Most Wanted Terrorists and Seeking Information – War on Terrorism Lists. Press release. ↑ "Iraq Terror Chief Killed In Airstrike", CBS News, June 8, 2006. ↑ "Zarqawi 'died of blast injuries'", BBC News, June 12, 2006. Retrieved February 4, 2009. ↑ "U.S. reveals face of alleged new terror chief", CNN, June 15, 2006. ↑ "Profile: Abu Musab al-Zarqawi", November 10, 2005. Retrieved 2006-06-20. ↑ Blum, William, "The American Myth Industry", CounterPunch, May 21, 2005. ↑ Jones, Gareth, "Sixteen held as police 'foil plot aimed at NATO summit'", Scotsman News, May 4, 2004. ↑ "Jordan says major al Qaeda plot disrupted", CNN, April 26 2004. ↑ "Jordan Airs Confessions of Suspected Terrorists", Associated Press, April 27, 2004. ↑ "Jordan Sentences Zarqawi To Death", CBS News, February 15, 2006. ↑ "Furious Jordanians take to streets", CNN, November 11, 2005. ↑ Hayes, Stephen, "What Zarqawi—and al Qaeda—were up to before the Iraq war. ", The Weekly Standard, June 19, 2006. ↑ "Zarqawi set up Iraq sleeper cells: U.K. report", Associated Press, July 15, 2004. ↑ "'Zarqawi' beheaded US man in Iraq", BBC, May 13 2004. ↑ Neville, Richard, "Who killed Nick Berg? ", The Sydney Morning Herald, May 29, 2004. ↑ "Beheaded man's father: Revenge breeds revenge", CNN, June 8, 2006. ↑ and Agencies, Staff, "Iraq terrorist leader Zarqawi 'eliminated'", Guardian Unlimited, June 8, 2006. ↑ Miklaszewski, Jim, "With Tuesday’s attacks, Abu Musab Zarqawi, a Jordanian militant with ties to al-Qaida, is now blamed for more than 700 terrorist killings in Iraq. ", NBC News, March 2, 2004. ↑ U.S. Department of State (October 15, 2004). Foreign Terrorist Organization: Designation of Jama?at al-Tawhid wa?al-Jihad and Aliases. Press release. Retrieved on February 4, 2009. ↑ "The Death of Zarqawi: A Major Victory in the War on Terrorism", The Heritage foundation, June 8, 2006. ↑ Ensor and McIntyre, David and James, "Al Qaeda in Iraq: Letter to al-Zarqawi a fake", CNN, October 13, 2005. ↑ "New ops planned in wake of Zarqawi hunt", United Press International. ↑ "Purported al-Zarqawi tape: Democracy a lie", CNN, January 23, 2005. ↑ "'Zarqawi' shows face in new video", BBC, April 25 2006. ↑ Abu Musab al-Zarqawi video bloopers. YouTube. Retrieved February 4, 2009. ↑ "Text of a document found in Zarqawi's safe house", USA Today, 6/15/2006. Retrieved 2006-06-20. ↑ Soriano, Cesar, "Iraqi leaders: Memo details al-Qaeda plans", USA Today, June 15 2006. Retrieved February 4, 2009. ↑ "After Zarqawi", Brian Fishman, 6/15/2006. Retrieved 2006-06-20. ↑ Karen DeYoung and Walter Pincus. "Zarqawi Helped U.S. Argument That Al-Qaeda Network Was in Iraq", Washington Post, June 10, 2006. ↑ 54.0 54.1 54.2 54.3 Mary Ann Weaver, "Inventing al-Zarqawi," Atlantic Monthly (July/August 2006): 95. ↑ "Saudi Al-Qaeda Terrorists Recount Their Experiences in Afghanistan on Saudi TV and Arab Channels", MEMRI, December 7, 2005. ↑ 56.0 56.1 Craig Whitlock. "Grisly Path to Power In Iraq's Insurgency: Zarqawi Emerges as Al Qaeda Rival, Ally", Washington Post, September 27, 2004. ↑ 57.0 57.1 57.2 57.3 57.4 Craig Whitlock. "Death Could Shake Al-Qaeda In Iraq and Around the World", Washington Post, June 10, 2006. ↑ 58.0 58.1 Robert S. Leiken and Steven Brooke. "Who Is Abu Zarqawi? : What We Know About The Terrorist Leader Who Murdered Nick Berg", Weekly Standard, May 18, 2004. ↑ 59.0 59.1 59.2 Gary Gambill. "ABU MUSAB AL-ZARQAWI: A BIOGRAPHICAL SKETCH", The Jamestown Foundation, December 16, 2004. ↑ Mary Ann Weaver, "Inventing al-Zarqawi," Atlantic Monthly (July/August 2006): 96. ↑ Mary Ann Weaver, "Inventing al-Zarqawi," Atlantic Monthly (July/August 2006): 98. ↑ "Total war: Inside the new Al-Qaeda", Middle East Online, February 4, 2009. ↑ "Total war: Inside the new Al-Qaeda", The Sunday Times, February 26, 2006. ↑ Walter Pincus. "Zarqawi Is Said to Swear Allegiance to Bin Laden", Washington Post, October 19, 2004. ↑ "Letter from Zarqawi to bin Laden", January 2004. ↑ Translation by Jeffrey Pool. "ZARQAWI'S PLEDGE OF ALLEGIANCE TO AL-QAEDA: FROM MU'ASKER AL-BATTAR, ISSUE 21", The Jamestown Foundation, December 16, 2004. ↑ "Purported bin Laden tape endorses al-Zarqawi", CNN, December 27 2004. ↑ Paul Wilkinson. "Zarqawi's Death and the Iraqi Insurgency", NPR, June 10, 2006. ↑ Michael Isikoff and Mark Hosenball. "[http://www.msnbc.msn.com/id/5280219/site/newsweek The World’s Most Dangerous Terrorist Who is Abu Mussab al-Zarqawi? And why are so many governments scared to death of him? ]", Newsweek, June 23, 2004. ↑ (page 90) Retrieved February 4, 2009. ↑ "Declassified Key Judgments of the National Intelligence Estimate "Trends in Global Terrorism: Implications for the United States" dated April 2006". ↑ "Tucson Raytheon had role in al-Zarqawi death", Arizona Daily Star, June 9, 2006. ↑ "Deputy unwittingly led troops to al-Zarqawi", Seattle Post-Intelligencer, June 8 2006. ↑ "Iraq terrorist leader Zarqawi 'eliminated'", Guardian Unlimited, June 8 2006. ↑ 76.0 76.1 "Abu Musab al-Zarqawi killed in air raid", Associated Press, June 8 2006. ↑ "Iraqi PM confirms Zarqawi death", CNN, June 8 2006. Retrieved 2006-06-08. ↑ "Zarqawi killed in Iraq air raid", BBC, June 8, 2006. ↑ "Zarqawi death a 'significant blow' to al-Qaida", Guardian Unlimited, June 8 2006. ↑ "Zarqawi 'alive when found'", The Guardian, June 9, 2006. ↑ "Was Al-Zarqawi Beaten After Bombing? ", CBS News, June 10, 2006. ↑ Smith, Michael, "How Iraq's ghost of death was cornered", Sunday Times, June 11 2006. ↑ "Military revises al-Zarqawi account", USA Today, June 10, 2006. ↑ "There Are Two Sides To Some Of The Stories That Pictures Can Tell", CBS News, 12 June 2006. Retrieved February 4, 2009. ↑ "A Chilling Portrait, Unsuitably Framed", Washington Post, 9 June 2006. Retrieved February 4, 2009. ↑ "World reacts to al-Zarqawi death", CNN, June 8 2006. ↑ "Abu Musab Al-Zarqawi Killed in Air Raid", AP News, June 8 2006. ↑ "Qaeda in Iraq confirms Zarqawi's death - Web site", Reuters, June 8, 2006. ↑ "New tape says Zarqawi death 'great loss'", Associated Press, June 16, 2006. ↑ "Al-Qaida likely to alter marketing efforts", Associated Press, June 9, 2006. ↑ "Al-Qaeda No. 2 mentions al-Zarqawi's death", Associated Press, June 24, 2006. ↑ "Tape: Bin Laden tells Sunnis to fight Shiites in Iraq", CNN, July 1, 2006. ↑ "Bin Laden recording praises al-Zarqawi", itv.com, June 30, 2006. ↑ "Bin Laden lauds al-Zarqawi; readies message", Associated Press, June 30, 2006. ↑ "Zarqawi Scheduled for Martyrdom", StrategyPage, June 8, 2006. ↑ "U.S. Moves to Stop Zarqawi Network in Iraq", Associated Press, June 9, 2006. History of "Abu Musab al-Zarqawi"
This page was last modified on 28 January 2019, at 20:16.